So here’s another wonder of the steam age: The SS Great Britain. 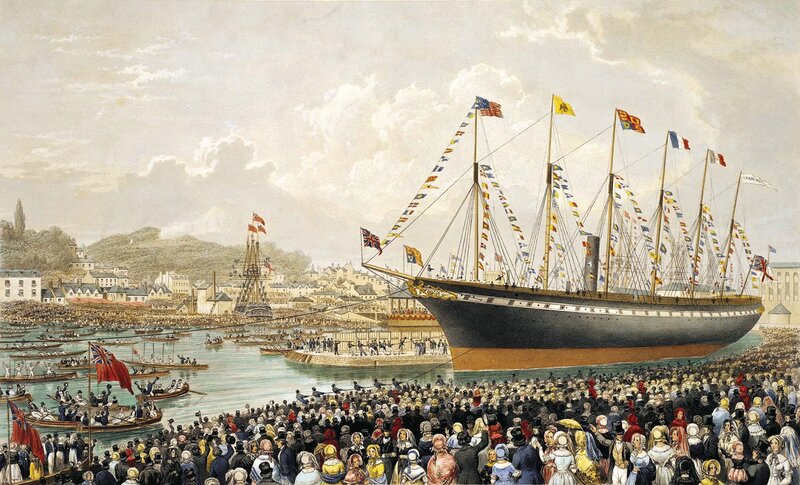 Now a museum, she was launched on July 19 1843, before Prince Albert could arrive to perform the ceremony. The longest passenger ship in the world in the mid-19th century (1845-54) and, crucially, the first ever large ocean-going ship to combine the cutting-edge technologies of an iron hull and a screw propeller. How the world has shrunk in the modern era. No really. Designed by, of course, Isambard Kingdom Brunel, for the Bristol-New York “run,” as it would become under such circumstances, she was the first iron steamer to cross the Atlantic, in 1845, and did so in 14 days. Whereas sailing ships took months. In the old days, you waved goodbye at the dock and maybe years later got a letter. Or never heard. But by the 19th century, with iron ships, modern propulsion and soon enough the telegraph as well, communication was instantaneous. At last we could begin to live. Noisily, I imagine, given the two-stroke engines, two of them, six feet long. And precariously, in that the ship took a long time to build and a long bankroll, including the long delay between launching and entering actual service that included a year trapped in Bristol Harbor, and forced her owners into bankruptcy after having to refloat her in 1846 when she was run aground by… human error. Oh. That again. Sold for salvage in 1852 and repaired, she carried immigrants to the desert paradise of Australia for decades before being converted to sail in 1881, ignominiously reduced to a warehouse, quarantine ship and “coal hulk,” in the Falkland Islands in 1884. Scuttled in 1937, she was brought back to Bristol in 1970, to the same dry dock where she was built, where she became a very popular tourist attraction. I wonder if they tell their hundreds of thousands of visitors a year that when it comes to globalization we have been there and done that. And it was by no means all smooth sailing.